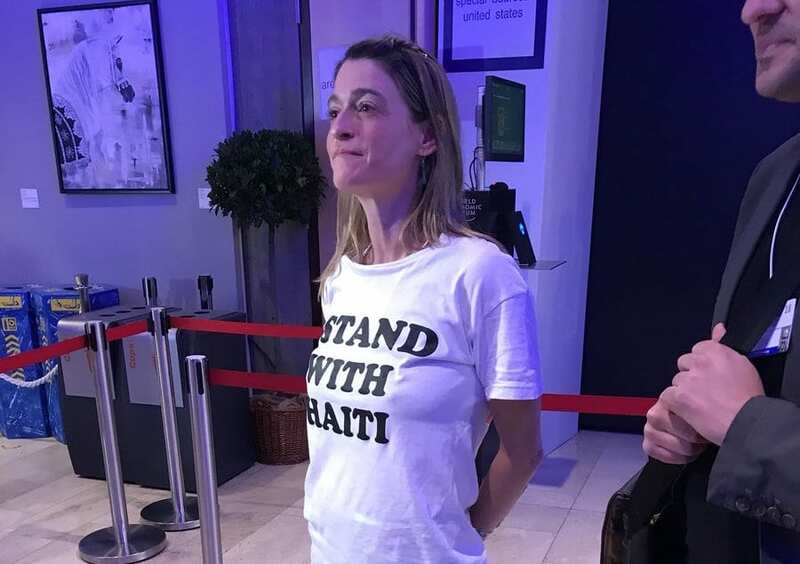 Protesting Trump’s “shithole” comment and in solidarity with the people of Haiti—a “beautiful, unique, revolutionary nation” — co-founder of SOIL, NGO focused on sustainable sanitation and ecology, voices dissent at global gathering. Photo: Jorge Ribas. “In particular, [Sasha] Kramer’s action was a response to the administration’s recent decision to end protections afforded Haitian refugees living in the U.S. under the Temporary Protected Status (TPS) program as well as eye-witness reports that Trump referred to Haiti, as well as other nations, as “shithole countries” during a White House meeting earlier this month, writes Jon Queally for Common Dreams. 1 Reply to "Common Dreams: Head of Prominent NGO Walks Out of Trump's Davos Speech"
Way to go Sasha! We stand with you!